Gather again and devote your time..."
When Ocelot Royce seized control of Alterion and declared himself High Mason, he maintained a relatively rocky relationship with his Provincial Regents. Some were outright replaced while others were permitted to keep their positions in exchange for increased tax rates. Several years passed and the Regents, while hostile behind closed doors, were openly unified in their support of Ocelot’s regime. During the King’s Feast an unknown faction executed a failed coup in an attempt on Ocelot’s life. As a result, Richter Grievous, Ocelot’s High Marshall and the First Sword of Alterion, was bewitched and later abducted after cutting his way through most of the Cathedrals security detail. His whereabouts remain unknown. Seeking insight, Ocelot entered his throne room to commune with the Crystal and has yet to return. In the months that followed, the Regents grew bold and began decreasing their tithes to the Masonry. Tensions mounted even further after a command was issued by Ocelot’s heir, Viktus Gallin , ordering the Regents to present themselves at the Capitol City. In response to this slight, and believing the Regents to be behind the attempted coup , Viktus has rallied an army to bring the Regents to justice and unite his home land. The Masons however are hesitant to dedicate themselves to an internal conflict and offer only neutrality in the war to come. In the wake of the Kings Feast and the attack on the partygoers, High Marshall Richter Grievous disappeared and Ocelot went into his throne room and never returned. He remains cloistered in there and is non responsive to all the Masons. Thus, Viktus, his current heir has petitioned the Masons to call the Regents in to swear fealty but none have responded. In response to this sleight and to unify his homeland, Viktus Gallin raises an army and moves to march on the provinces. Setting his sights on Setroth, Viktus prepares to contend with the powerful Tyndall family in a bid for control over the province. Taurus had invested heavily in having Alterion based territories outside of Xaengri-La where the main kingdom had resided. Instances like these, served to validate the investment. Where as "The Dominus" had been activated and transported from Xaengri-La to an embassy structure just outside Izral. From there these S-Class Stratospheric Carrier vessels---A hot commodity produced by the Taurean Aviation Technologies Development Department-- did the work of moving the asset quietly, quickly and safely across the expanse to the issued co-ordinates. The Asset could very well make the trip on his own steam however, "Quietly" would hardly be a word used to describe the movements of a 12' tall, 4 ton Obelisk of a man, bounding through the heavens and descending again in random locations, on repeat. No, instead, they went undetected at the behest of the latest and most cutting edge stealth technologies which included an advanced Photon-Encrypting Camo-System, RA-Materials and a fully Neo-Fiber Optically based AI-Pilot/Navigation system which devoid the entire vessel of a traceable digital signature, or life signs. The vessel was Autonomous. And knifed through the atmosphere at hyper-sonic speeds en-route to the input destination. "S.E. Grid 4.513 due two hundred miles south east of the Setroth Province"
"Asset-Dominus', We are approaching Target location. Prepare for drop in." He stood and walked through the 3D rendering and heavy foot-falls would carry him further into the darkness. Only the sound of his fist hitting the button to open the bay doors could be heard before wild winds tore into the bay area, picking up the massive length of Cloak behind him, the Furred collar at his neck swaying against the lashing air before two steps were taken and he'd have bounded from the Vessel into a full blown Dive from well over 60,000' in the air. Needless to say, at his size and stature, The Dominus, BULL, picked up speed quickly, and alot of it. He was a marvel to spectate, something his size, committing an act so brazen and bold. So suited for wild displays like this was he. His eyes didn't blink. His absolute resilience, and the fact that He didn't require air, food, or water, allowed the 250+Mph descent to be taken in stride with no visible discomfort to himself. Even his approach to the ground, changed his demeanor, and just when impact face first seemed imminent, he'd legs would flip and his feet would collide with the ground beneath him in a loud....resounding.. The seismic event triggered by this action alone, would see to it that the geographical landscape of his clearing would remain forever changed. It wasnt everyday that there existed someone who's very arrival onto an area---could force individuals to have to RE-DRAW maps. Fissures and ran as far and wide as the length of the massive crater left in the wake of his arrival, which was more then 3 meters deep at the center where he stood, getting shallower at the edges, that he approached and now stood before speaking into a <comm> unit..."This is The Dominus....I've arrived and im awaiting contact." Richter Grievous’s flagship, the Heretic crested the skyline and played lead to a team of similarly sized command ships coasting into formation. Word traveled fast throughout the Provincial territories, carrying the message that Ocelot's brat was going to war against his own countrymen...a skewed way of looking at it, in Viktus' mind. They'd taken to calling Viktus' army the Unified Axis Forces, though the reasoning behind the name had yet to be explained to him. Prince, Heir Apparent and Commander of the Unified Axis Forces Viktus P.C. Gallin sat still in the cold, dark, and silent embrace of an issued ALT-PM-00 Sovereign Assault type mobile soup, provided to him courtesy of the Order of the Valiant Sky. The machine hummed to life. Once active, the idle birthed a turbulent vibration that coursed through the chassis, heavy armor, weapons and metal appendages attached to them. Great care went into the Sovereigns redesign; fixed armaments like the Heat Lance replaced the factory Beam Saber. The ALT-50D 120mm Machine Gun would be utilized, and supported by the 880mmRB-T27 Raketen Bazooka and maduria alloy shield. He took stock of his weaponry, he took no pleasure in slaying his kinsmen, but insubordination among his Regents would not be tolerated. They would fall in line, or they would be replaced. "Hold formation," Viktus ordered, softly. "Heretic Squadron will eliminate the recon team and rendezvous with the asset." Stabilizers located across the frame twitched in a blur and performed omni-directional shifts as several tests were run. By the time the hatch opened and Viktus took his seat, the many and busy metal appendages would release The Sovereign and the sound of locks disengaging echoed. All harnesses fastened, Viktus’ hands found the cold shifters and levers. Vernier thrusters exploded from the Mobile Suits hips, skirt, and rear upon initiation, pressing Viktus deeper into his seat. As the bay doors inched open, sunlight shattered the darkness of the hold. The cold rush of atmosphere crept in, and with it, the violent roaring of the easterly winds. The orderly acoustics of the cockpit sang against the cacophonous gusting winds flooding the bay as the mech shuddered all around him. A vast arm mechanism clamped the Sovereign’s torso and spun the machine into place. The large mobile suits form laid against a stationary catapult that hung in the opening where the bay doors swung ajar. The Valorous’ command ships, and by extension Grievous’, were the epitome of utilitarian; suits launched stationary from the door. After quite some time, Viktus finally grew accustomed the static sound of his voice against the glass and tight quarters of his helmet. Simultaneously, the foreign and unwelcoming, blended with the familiar. Briefly, Viktus fought the wavering in the back of his throat. He was in command now and could not afford to let something as inconsequential as fear bring the persona of the conquering prince crashing down. The maduria composite shell around him groaned under the abrupt shift of force at its back, as the rockets bursted forth and jettisoned the suit into the sky and towards the Setroth Province below. The tell tale sound of the Crystal reactor filled the cockpit and rang in his ears before stabilizers silenced it . Control sticks slammed forward in simultaneous conjunction with acceleration pedals, correcting and guiding the pristine Sovereign’s descent. Thrusters carried him forward, darting around the wind currents and towards his destiny. "Asset- Dominous, This is Heretic Squad Leader. We are en route to your location." Emerald eyes perused the wealth of date coursing across his screens. The recon team was small, no doubt dispatched by Regent Tyndall, upon notice of the assets entry into the Province. While the Masons as a whole agreed to remain neutral, the provincial chapter houses served at the Regent's pleasure unless so otherwise inclined. It seemed the Poor Sons commander for the Setroth Province had yet to fully commit himself, but was not prepared to openly defy the Regent. How else could Viktus justify the man sending a squad of two mobile suits towards the landing zone. As Viktus bore down on them, he was surprised to find them oblivious to his presence, the Heretic's radar jamming capabilities evidently doing their job. Fortunately, for Viktus the Sovereign patched directly into the Crystarium, ensuring that he had eyes even without radar. The neural network of the Crystal reactor coalesced throughout Viktus' brain allowing him to see as though the Soverign was his body and not the frame surrounding it. In one smooth motion, he raised the massive machine gun, took aim and let loose two heavy caliber rounds towards the unsuspecting pair of scouts. Their smaller Recon type mobile suits were not suited for a great deal of damage, let alone a great deal of damage aimed specifically at the mecha's vulnerable regions. The blue and white suits were knocked off course, jarred by the impact of the slugs and spun into one another before exploding in a cloud of dense black smoke. Pulling up, Viktus eased into his descent and landed with a relatively minor thud outside of the crater. A thin sheen of dust and debris clouded about the mobile suits lower limbs and when it cleared, Viktus was lowering himself down via a small utility cable. Removing his helmet, Viktus pressed his fist to his chest in a salute towards the asset down below. "Asset-Dominous," he called down. "I'm Viktus Gallin. Thank you for waiting." The combat asset known as "Mechs" were still concepts as both tool and enemy to Proteus, who felt no way about being used as bait to draw out actions from the enemy. He'd had barely had a chance to give an expression across his face before they were destroyed by the "Presence" on hasted approach (Between the type of Core/Drive in the mech, and Viktus himself, sensing either works or both) that obtained his focus and attention. These tools were interesting, and the only reason they had lacked appeal was due to the unmatched success with their "Avatar System" and "Specialty Squads" used in their own military applications. Taureans were naturally a sturdy, prominent people as a race, a Superior platform from a Core, Utilitarian outlook to base a wide range of applications to in regard to amassing a military, or law enforcing force. Their King, and WND-Department had managed to take even their Greatest Asset -- Their King, replicate and mass produce even a fraction of that for Use---as demonstrated now, The Dominus', taking steps forward to meet Viktus' at the end of his descent, nodding at his greetings. "...Dom...will suffice, Prince Viktus, and ready." Briefly, Proteus' eyes adverted to look over the Mech, with Piqued interest. The avatars are dispatched to combat everything and anything be it small armies, to Kaijuu. Only in a few instances have they had the pleasure of combating these powerful instruments of war---The Mech. HIgh offensive power, and suppression capabilities as well as potential for mass destruction with properly equipped. Resilient, and sturdy, a fearsome blend of offensive prowess and defensive talent. He could relate to it. A smile formed before his visage returned to Viktus, "I can understand your request for assistance, about how many of these do you think we will be facing? I'd be lying if I said I wasn't excited..." His contemplation look concluding in trade for a ready expression. The holo array did the King of Tauren little justice. He was much larger in person, rather this representation was at least. If the man’s staggering size unnerved Viktus he did not show it, approaching the man with the same calm collectedness with which he’d arrived. “Dom it is then.” Viktus responded with a warm smile, removing his helmet and tucking it under his arm. Garner in a black and red flightsuit, Viktus might have been any mobile suit pilot from his army is not for the Golden ensignias embroidered across his lapels. A flaxen brow perked at the larger man’s question. The question was not without purpose, nor was it fool hardy, but it proved a difficult one to address honestly as with much clarity. While the prince spoke, Dom's ears clung to every single syllable. In his mind plays the highlight reel of His past deeds, in other lands. These would have man labeling the name "The Bull" or "Proteus Rauz" as a brute in a class and world all of his own. Who's many eats of strength are what the greatest myths and tales consists of. He's felled creatures the size of mountains. Rewritten a maps take on the terrain of a region with his bare hands. Here and now, as Prince Viktus lays down the bare numbers in a forward unflinching manner, Proteus' intelligence, (Often overlooked) makes itself present in the form of a tactical epiphany, coincidentally it occurring at the conclusion of Viktus' dialogue and apparent inquiry. The entire time Proteus' gaze had adhered to the ground before him, and only once or twice did it take to the horizon to view the assets on display. The look he gave, not to Viktus but ahead at an army that had not yet amassed. In the direction of the great engagement that he visualized where the prince stormed onto a battle field that was ripe with victory for the taking----Because the right moves were made, and "The numbers were thinned......" Mouthed silently beneath his breath before he turned and looked down Viktus. "If I can promise you to put down at least 3/4 of their forces, before I myself may be possibly neutralized, would that be enough to put the numbers in your favor?" Proteus expected some look on the face of the prince. Nothing outwardly apparent or over the top---This man was Royalty after all, and a warrior in his own right. Still, it was a question that was sure to draw at least curiosity. In Proteus' mind, those very acts of legend sounded like they were exactly what was needed to soften up this large force. He never broke eye contact, "I've no intention to undermine any plans or strategy that you and the allies have and will come up with. If Im to be frank, it's best that im not included in them, only plan on setting me loose on your enemies, and I will do my absolute worse unto them..."
"What say you prince Viktus?" A cool westerley breeze threatened the mute Dom’s words, but the youth’s emerald eyes made a steady read of the giant’s lips to piece together his statements. When Dom concluded, Viktus questioned his own comprehension of the man’s words. The avatar’s estimation (either over his own abilities or under of the Setroth military) brought an incredulous quirked brow and a tilted look of disbelief. While it wasn’t impossible for a single individual to accomplish this, it seemed highly outside the realm of probability...hell almost outside of the realm of reality. Then again, the avatar did belong to a being of otherworldly power, perhaps Viktus was the one underestimating someone here. “If you don’t mind being used as bait...” Viktus added cautiously.”It will allow us to draw our prey where we want them. However...” Viktus paused thinking better of his words. When an overly long amount of time eked by, Viktus explained himself. Viktus shrugged and donned his helmet. “Hopefully when the Poor Son’s see us in battle they’ll elect not to support the Tyndalls. If they do...well, they say the best way to eat a dragon is one bite at a time. Either way, we should get moving. Whether reinforcements appear or not, we're assaulting Hedier's tower in two hours. 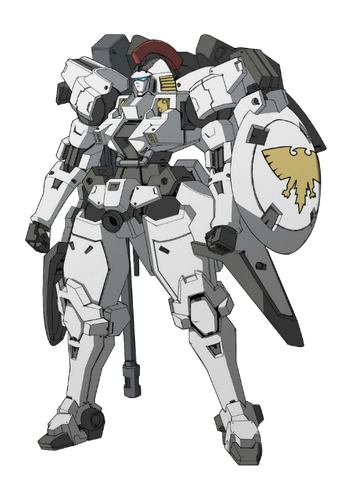 ” Dropping his arms at his side, Viktus turned towards the Sovereign and began his trek back to the ivory mobile suit. And so in this moment a very clear point had been made without even trying. The assets as prominent as they are, represent The King in a younger, far more reckless mind state. Head strong. All to willing to go directly into combat with little care or reason for safety----of their and others. So when the prince mentioned his concern for collateral damage, the proverbial wind had been snatched from eager sails. This was a righteous claim. If Dom were to claim that his methods wouldn't have taken a toll on the lands and it's people, he'd be a liar. The error in his thinking had made him all but to receptive to Viktus' plans and as the prince turned so did he--Dispelling the wild aura of energy that was around him. "Bait it is...We do this your way Good Prince. I will meet you at your command ship." Changing his direction to that of a southern one, he'd go into a light jog that became a full blown sprint. That second action came with effort, his effort resulted in force, force substantial enough to cause the ground beneath the balls of his feet to explode with every forceful step he took. It repeated like a machine gun, until suddenly he bounded upward and away, rocketing into the heavens under the power of his legs. Seeing a figure of his sheer size and dimensions move so was quite the show, but seeing as how Dominus (Like Proteus Prime) had a dislike for flying under his own power. It was a show he was always often willing to give. His initial jump would have him pique nearly a 1/4 of a mile into the sky, but 4 times that in distance from launch before gravity began to do it's bidding, (1) beneath his feet a construct appeared, hard light, runic in shape, and sufficient enough for him to LEAP yet again...for more distance. This...was how he traveled. Under the power of his legs, Dominus can clear vast distances in a single leap, or remain air borne and travel or change direction by utilizing a hiking spell. Nonetheless, the mentioned vessel had come into sight, landing as instructed and the changes had been made to his own trajectory so that his forceful arrival didn't threaten the ship in the slightest. Yet another impressive vessel. Alot like those produced by his own kingdom for both commercial and private use, it's size and shape were intriguing enough. Dominus would have waited for the vessel to continue it's landing, and the Prince's arrival, and continued to admired the vessel as it did so. 1 - Spell of Hike - Utilizing this spell, Dominus manifests a hard light construct consisting of magic beneath his feet from which he can Jump, or if needed stop himself or change direction. The manifestation of this construct is immediate and can be placed wherever Dominus needs it while in movement. There were a number of mundanities that needed occur before Viktus and Dom could meet once again. After his return to the Heretic, Viktus changed and outfitted himself for battle whilst the Sovereign underwent routine systems checks and the various armor and weapons were installed to convert the unit into an Assault type. Viktus stood before the full length mirror in his quarters, astonished at the circumstance he found himself in. He still wasn’t used to the military regalia, rather the intricate epaulets that marked him as the Supreme Commander. The tall youth peered down at his bare hands. His flesh was a dark apricot from overexposure to the sun and numerous nicks and scrapes left small white scars across the exposed surface. Emerald eyes settled on the brand stretching across the back of his right hand and his thoughts turned to Kalenis. “I do not act out of hatred.” Viktus spoke to his reflection. “This is balance...the Regents...the Masons...the Daius...the Rebellion...they’ve never brought peace.” The man in the mirror smirked at Viktus, it’s grin a dark pantomime of the sober youth posed before it. Staring the young blonde man in the mirror down, Viktus clenched his teeth. “I will bring peace.” This time the reflection corresponded to his own actions, putting the youth at some measure of ease. Fastening the last button on his coat, a finely tailored thing of clack and crimson, Viktus turned and exited his quarters...the dark figure in the mirror remained in his wake, smiling. Motioning toward the holo overlay of the Setroth Province laid out before the men, Viktus drew attention to a large river due southwest of Heider’s Tower. “We’ll use Dom and the Sovereign to draw out Tyndall soldiers stationed around Heider’s Tower to this location. Dom and a Squad of land unit mobile suits will engage the enemy ground forces, while Sovereign squad will draw the aerial suits across the river and engage them there. When they engage us across the River, the First Legion's aerial squad will flank the Tyndall forces while the rest of the First Legion secures Heider's Tower. The remainder of our Legions will remain ready and stationed on the Command Ships. If Regent Tyndall launches an assault from Yggdradern I want to be able to bring as much to bear on him as we can. " Turning his gaze to Dom, Viktus quirked a golden brow. "I was intending to send a squad of ten land based mobile suits to accompany you, unless you feel you can handle the ground forces on your own?" The question was posed seriously, because Viktus had no reason to believe Dom could not live up to his claims. "Keep in mind I need Heider's Tower in tact after the fact." The of this was new to him. Even the Original has never acted an asset to an army, let alone a soldier. Dom had spent his time aboard the carrier to admire. It's dimensions, the technological state, the soldiers on board----to whom which seemed as intrigued about him as they were anything else about the mission. He had managed to lap the entirety of the carrier (Or at least the places he could fit) before he found himself into the area of the bridge, and among many who were now gathering for the same cause. With the same objective. Putting it all on the line for the same man who appeared at the bridges highest point to address them. Proteus had picked his spot, at the front, where every soldier if they so chose could lay eyes on a prominent chess piece on the board----and be confident in it. Draw power and determination from it. He stood his tallest. His shoulders broad & firm. His facial expression was stone. The Fur collard cloak draped over his shoulders permeated the ranks of those who decided to stand close enough, as if it were some sentient living thing. Some of the men were intimidated by it, some fascinated, a few had a mixture of both. All eyes and attention befell on him at Viktus' inquiry, in which he replied soundly, "I will handle it alone. The only individuals who should be put in harms way is the enemy...". He'd have opened his palm slightly, displaying very intense, but minute and controlled arcs of power through and along his fingers before coiling his massive mitt back into a fist and nodding in confirmation to Prince Viktus. "Not a single brick out of place good Prince.."
Silence befell him, his arms crossed and attention remained affixed to the Prince be it to hear the rest, or any amendments to his plan or further inquiries.